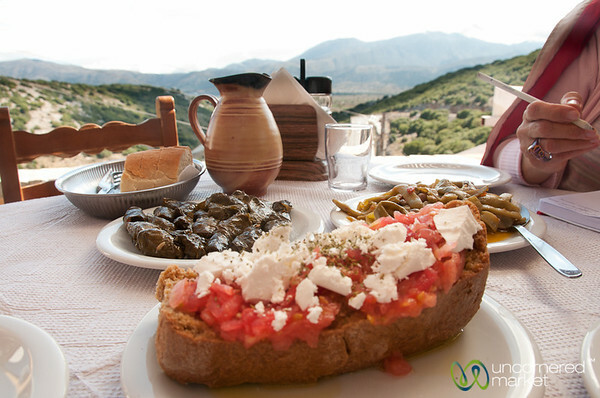 Dakos (dried bread dipped in water and covered with crushed tomatoes, olive oil and feta cheese), dolmades (stuffed vine leaves) and fasolakia (fresh beans with tomatoes and olive oil) for lunch at Seli Ambelou near Lassithi Plateau in Crete. 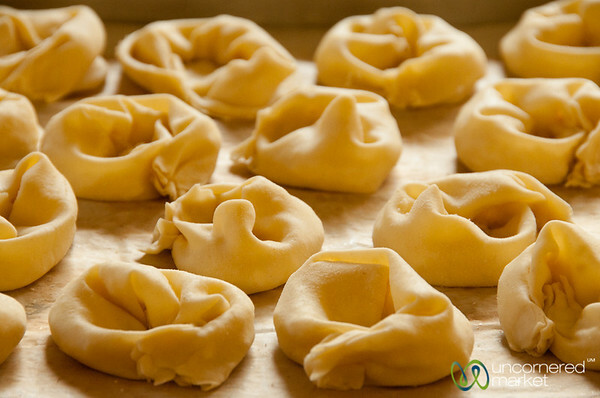 A tray of sarikopitakia (cheese-stuffed pastries) ready to go into the fryer with olive oil. Crete, Greece. 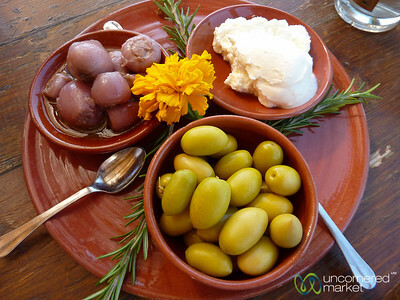 A delicious plate of green olives, pickled wild red onion bulbs, and fresh Cretan soft cheese. Agreco Farm near Rethymnon, Crete. 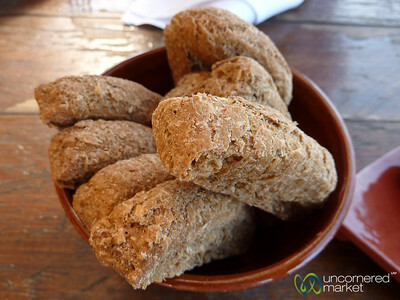 Rusks are dried Cretan bread that are used for making dakos (covered with crushed tomatoes and cheese). 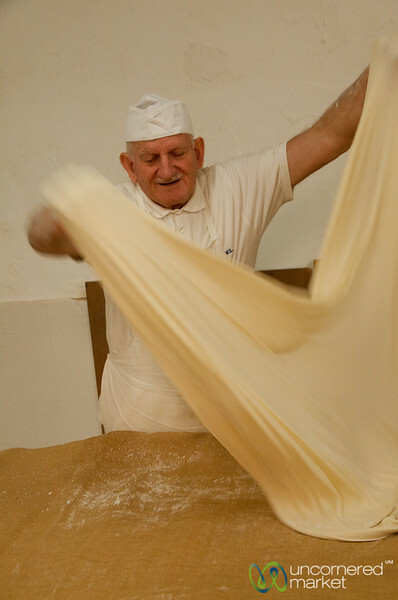 Agreco Farm, Crete. 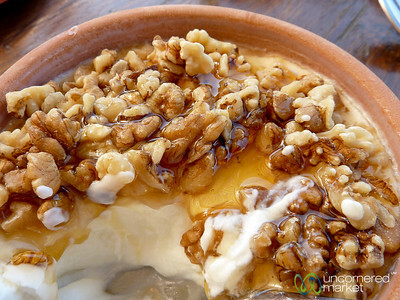 Rich Greek yogurt with honey and walnuts at Agreco Farm on Crete. 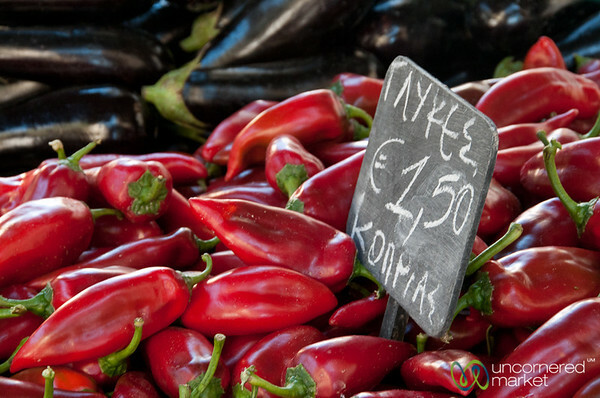 Piles of peppers at the Heraklion fresh market. Crete, Greece. 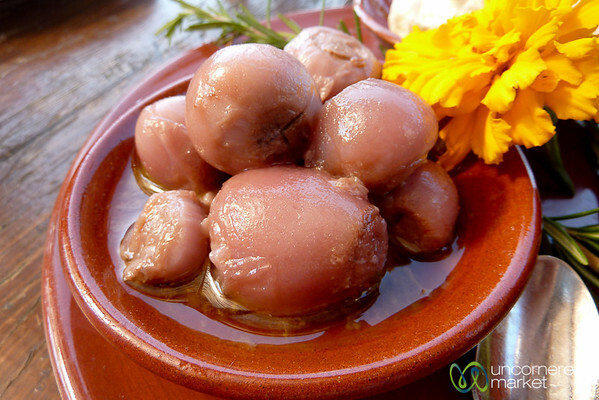 Sweet wild onion bulbs pickled as a starter at Agreco Farm on Crete. 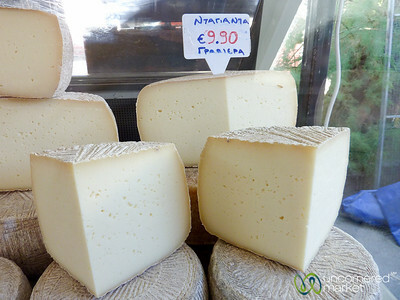 Wheels of graviera cheese (Cretan cheese) at the fresh market in Heraklion, Crete. 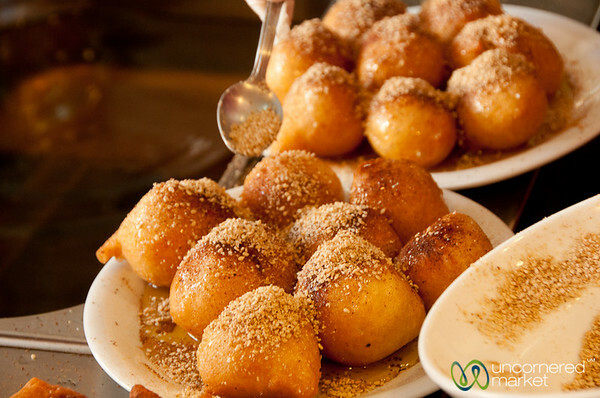 Loukoumades are like doughnut holes fried in olive oil. Heraklion, Crete. 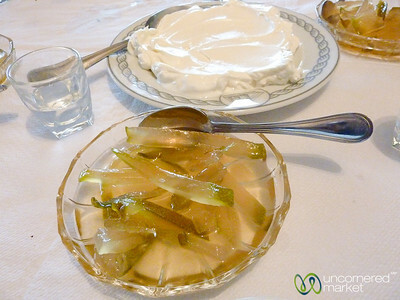 A simple and delicious Cretan dessert of bergamot orange in a sweet syrup, Greek yogurt and raki at Taverna Spinalonga ARIS in Plaka, Crete. 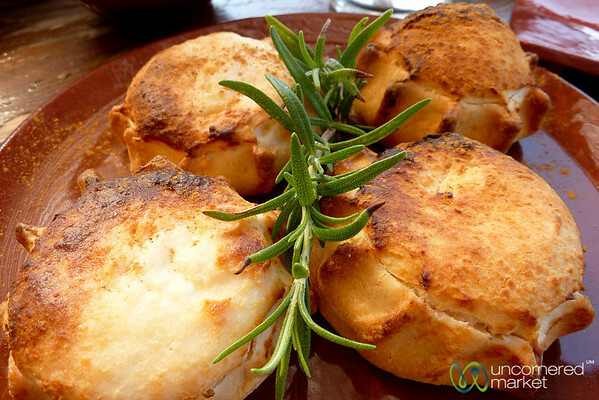 Light, delicious, cleansing. 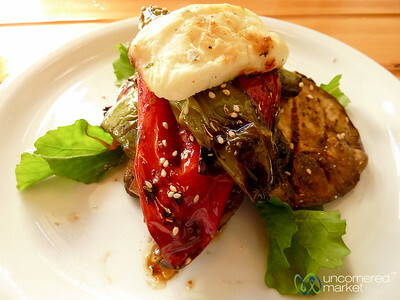 Light lunch of grilled vegetables and cheese in Chania, Crete. 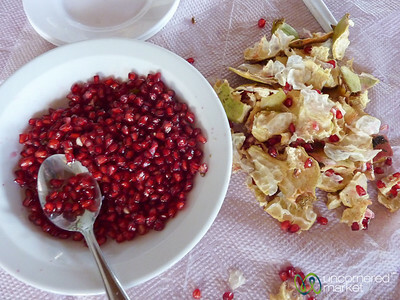 Pomegranate seeds and skins in Apostoli, Crete. 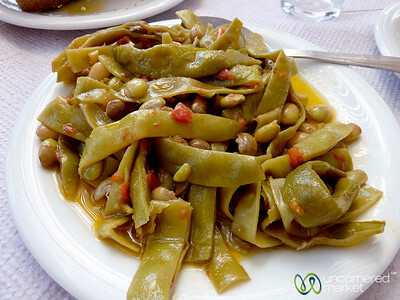 A delicious bowl of fasolakia (fresh beans cooked with tomatoes) at Seli Ambelou Tavern near the Venetian windmills on Crete. 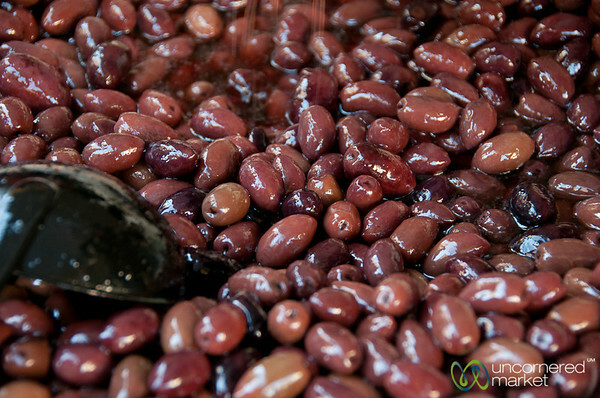 Greek olives at the fresh market in Heraklion, Crete. 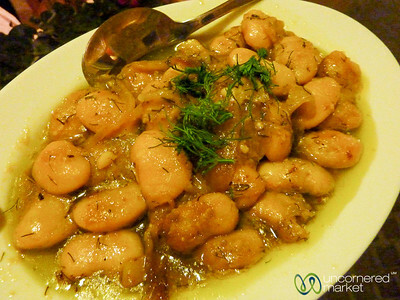 Delicious fava beans in Cretan olive oil in Chania, Crete. 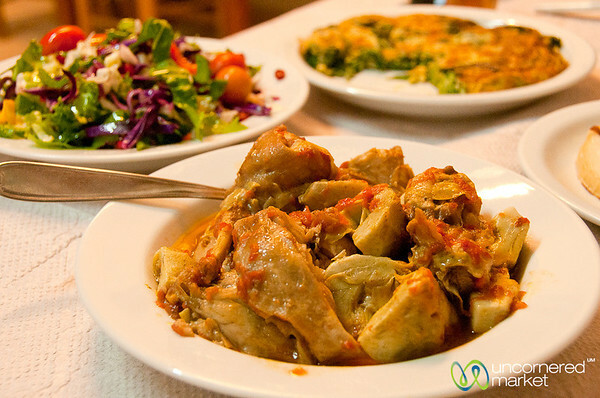 Delicious last meal of artichoke and rabbit stew served with salad, omelette with greens, fried cheese and Cretan rice (with sheep). 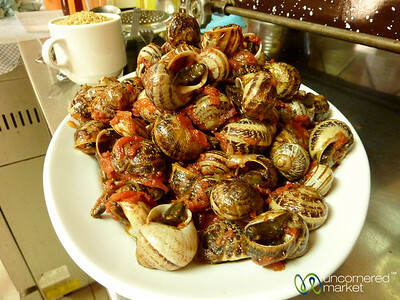 Served in Apostili, Crete. 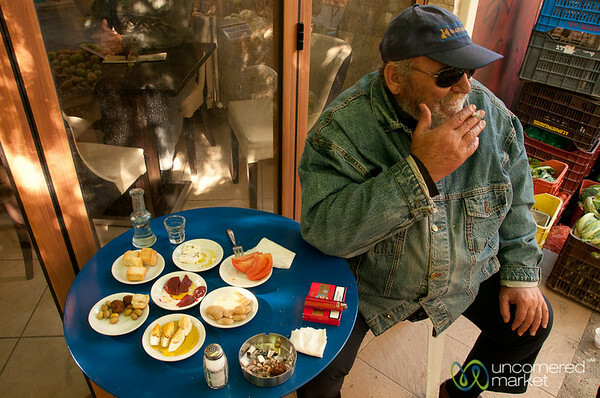 A table full of snacks to go with raki (local alcohol) at the fresh market in Heraklion, Crete.